February 5, 2018 8 Comments This post may contain affiliate links. This post is sponsored by Cost Plus World Market all ideas and opinions are 100% my own. This post also contains affiliate links which means should you make a purchase I may receive a small commission, your price stays the same. I bet you guys didn’t know I was born in Louisiana. And my mom was raised in New Orleans. 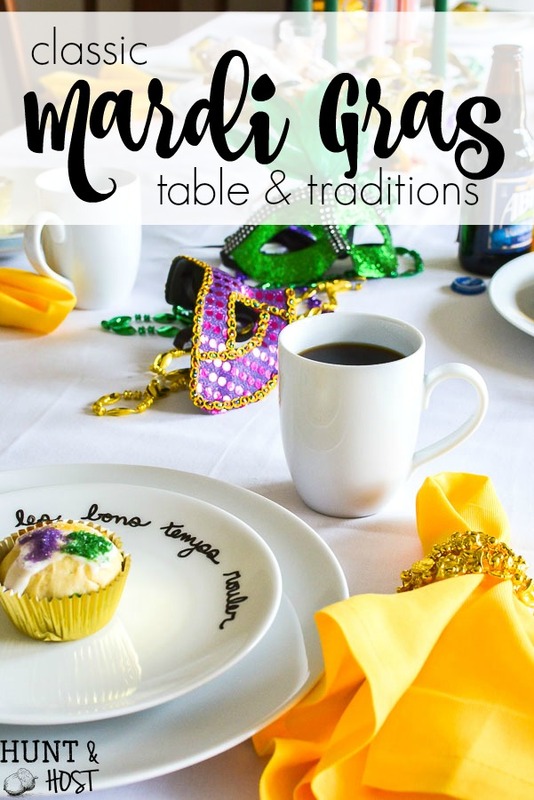 While I’m not an expert on all things Mardi Gras, I do have a pretty good grasp on the tradition and today I’m showing you an easy classic Mardi Gras table with a few fun tidbits thrown in. 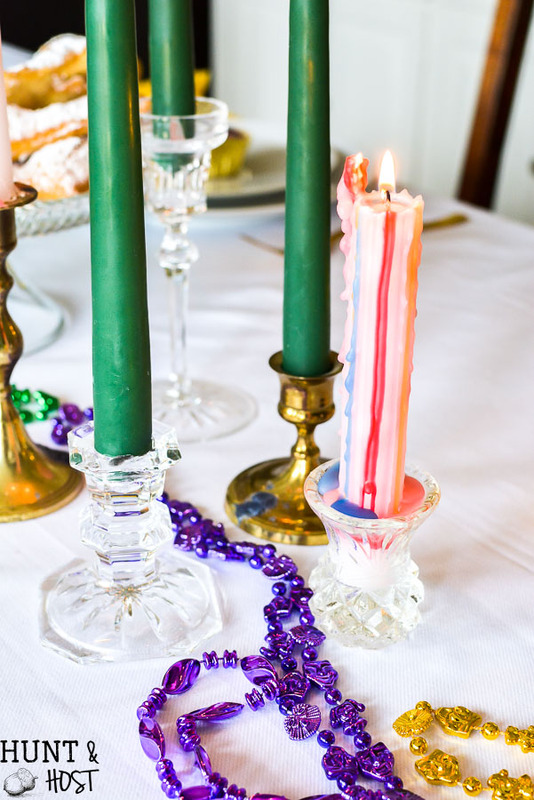 My krewe is gonna love this festive table and I think you will too. Cost Plus World Market had all the goodies, including Mardi Gras food I needed to bring the French Quarter to Texas! 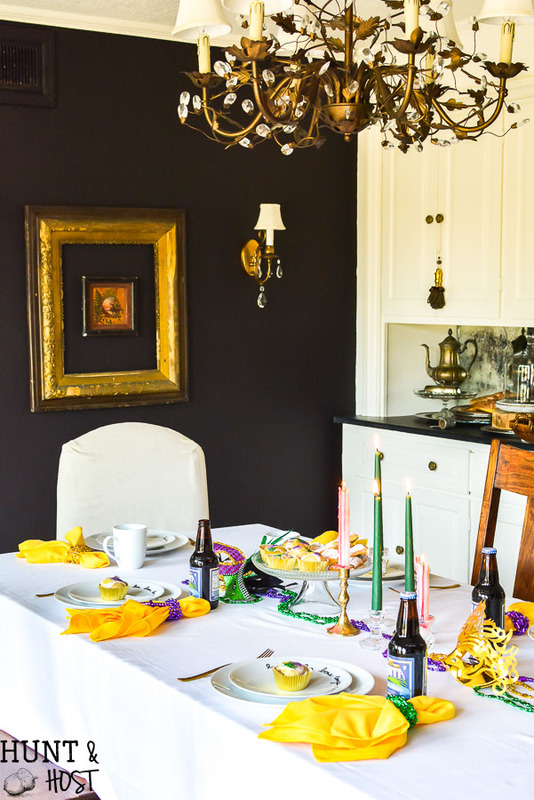 When my mom was young she and her siblings would have Mardi Gras parties in their basement where they would dance, have drinks and eat king cake. I thought it would be fun to have our own little basement party with all the classic elements of the season. Do you guys decorate for Mardi Gras? 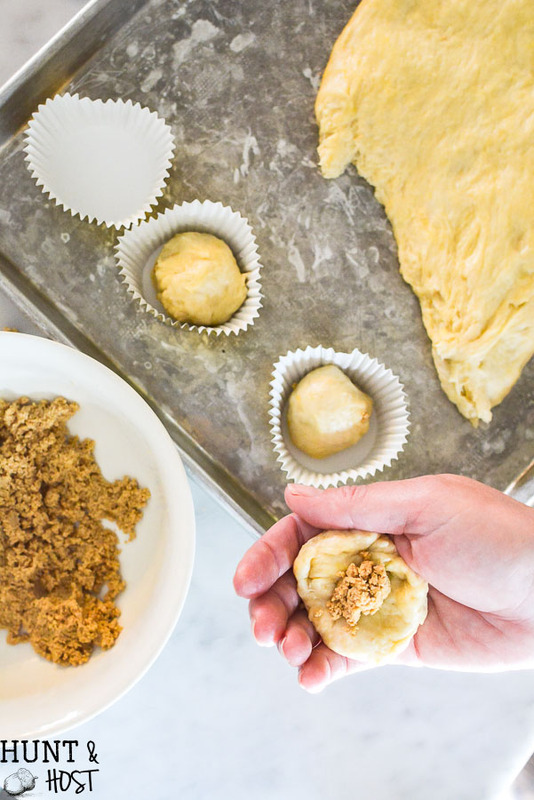 We don’t always, but it’s such a festive time and I’m all about a good excuse to throw a party! Mardi Gras is really an event to kick of the Lenten season as we prepare for the resurrection of Christ. It sure has gotten a little off track but if we look back on the traditions of Mardi Gras we can bring back the regal elegance it holds. 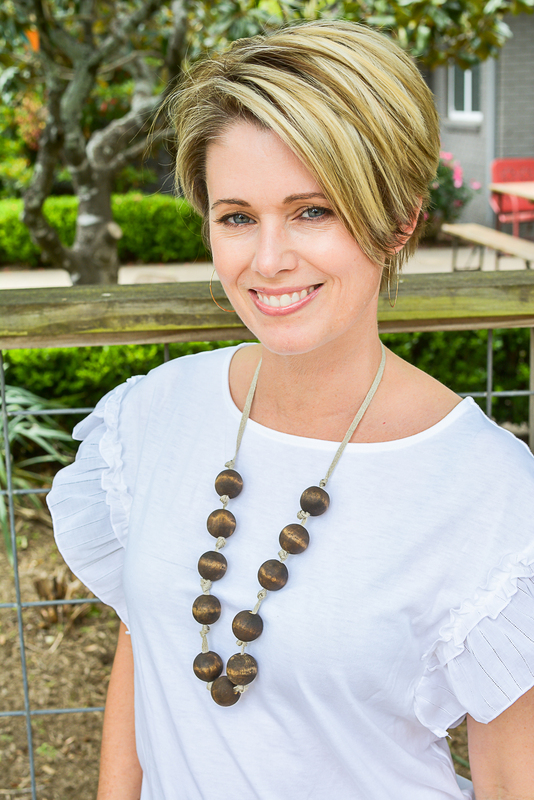 The Cost Plus World Market in College Station (find your closest store here) always has a great holiday selection for any occasion so I started the party supply hunt there (I have a handy shopping list down below for you in case you want to try any ideas or foods). How often do you eat on a crisp white table cloth? It makes me think of fine dining and is such a fun thing to throw into the mix at our home for a completely different feel. Plus Mardi Gras balls used to be THE upper class thing to do, fancy schmancy! I started off by getting some simple white dishes from Cost Plus World Market, they’re a blank slate when it comes to table decor and are so awesome to mix and match with stuff I already have on hand. 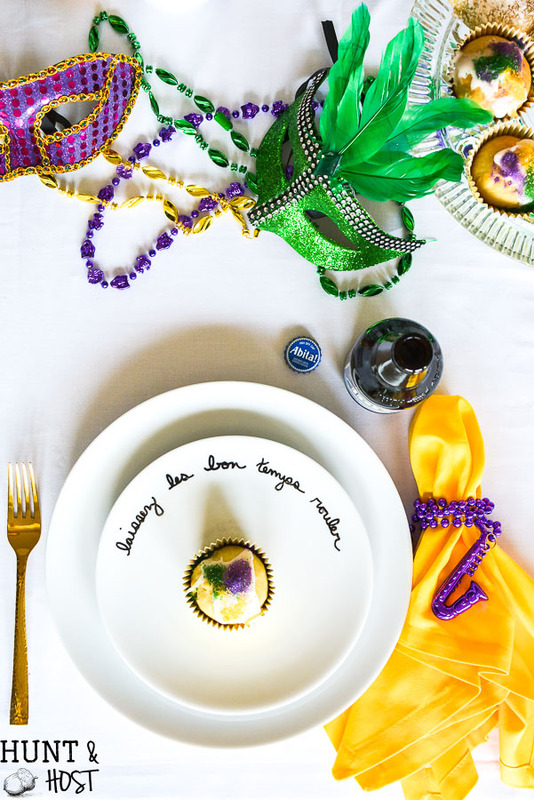 I wanted to dress up the salad plates for the Mardi Gras occasion and this little plate decorating DIY is simple enough to add a unique touch to any special occasion. I got a plate a fewer inches smaller than the salad plates and used a dry erase marker to trace a curved line around the rim of the plate as a writing guide. 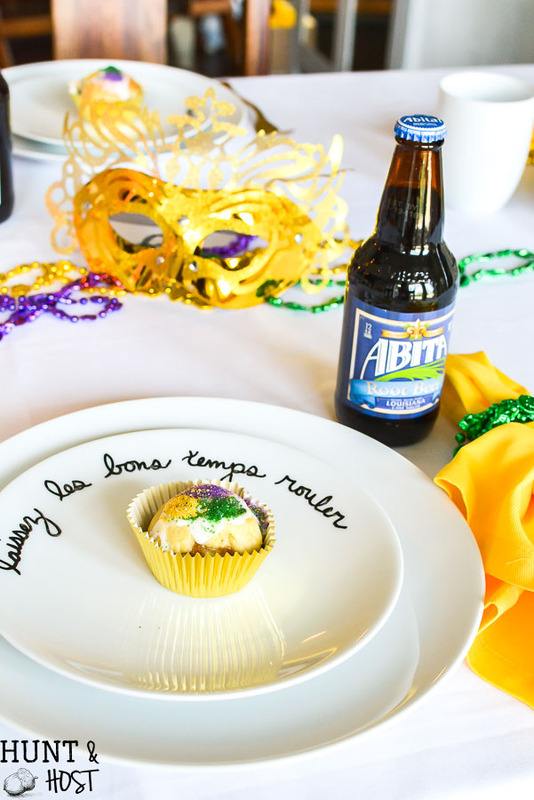 Next I used a glass paint marker to hand write laissez les bons temps rouler around the plate. 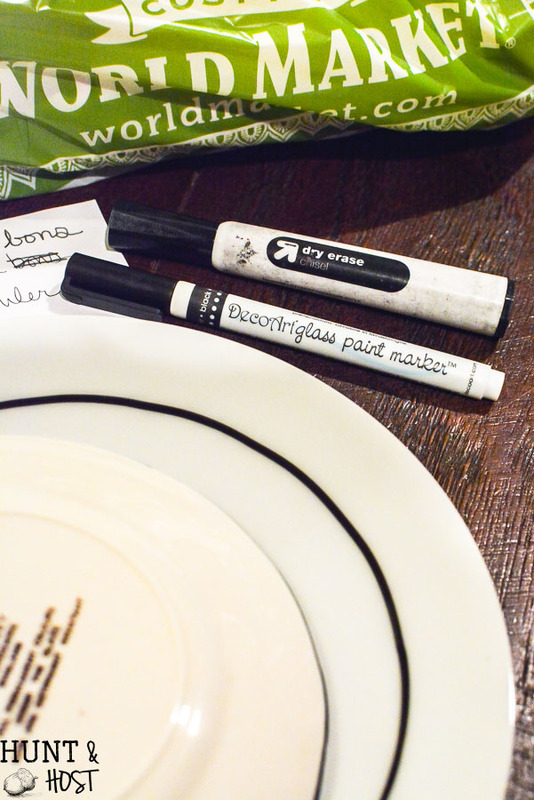 (follow baking directions on the marker package to set the permanent glass marker!) That means “let the good times roll” for you non-French Cajun folks! 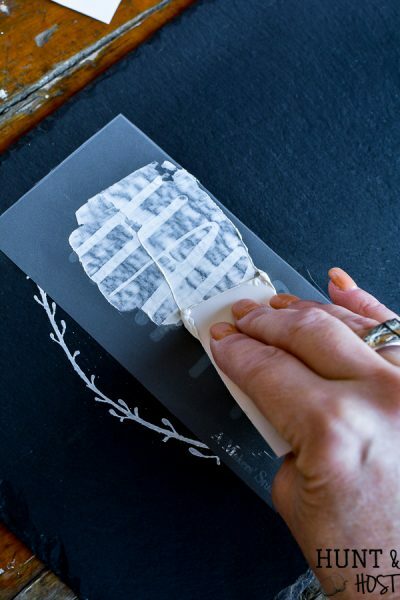 Once the paint marker dries the dry erase just wipes away!How simple and cute is that? I’m totally gonna do this for more stuff. Cost Plus World Market has the best napkin selection, they have rainbows of colors and I got these perfect gold napkins there. 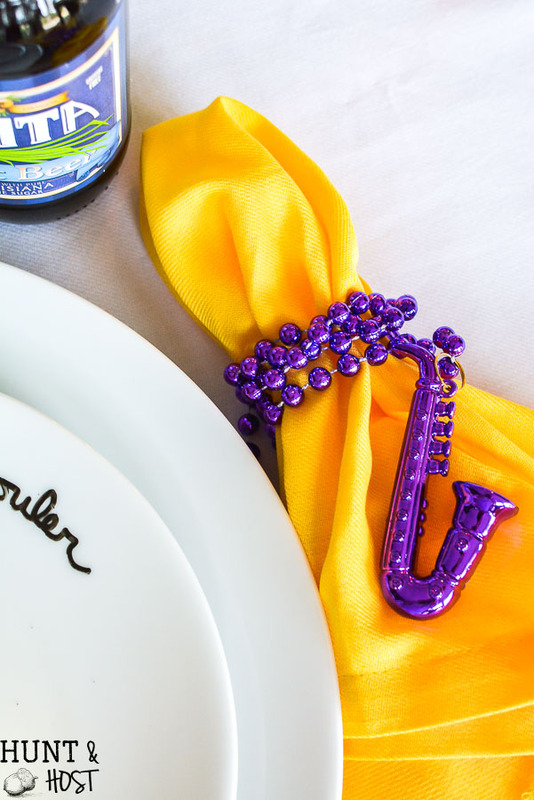 For an easy napkin ring I wrapped some Mardi Gras beads around a gathered napkin. The parades in New Orleans are amazing, gorgeous, decorated floats oozing energy and spirit overflowing with krewe members throwing handfuls of beads and doubloons. You know my kids love these! 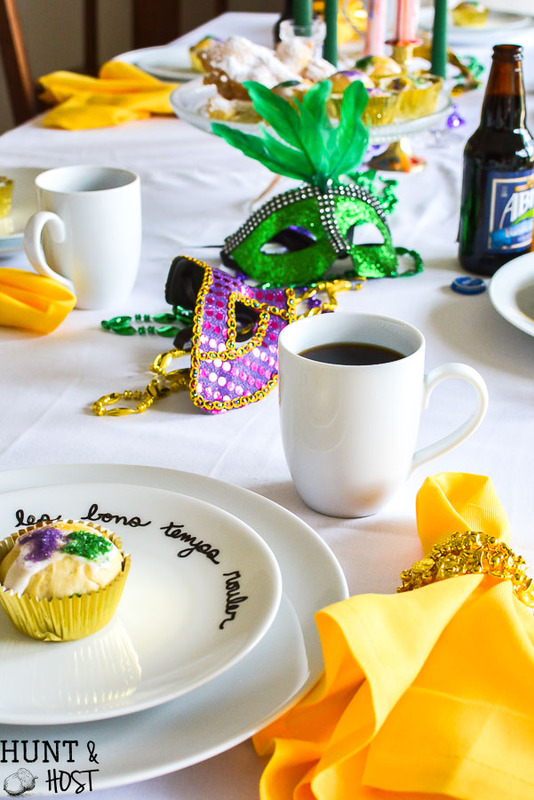 Scattered on the table are fancy Mardi Gras masks – a reminder of the grand Mardi Gras balls that everyone attends after the big parade. Actually dressing up wasn’t just for the balls. My mom and her family would all dress up on Fat Tuesday and head down to Canal Street to watch all the parades, school was out for the whole week and homemade costumes where on the to do list. My favorite story is when my grandmother dressed my aunt up as a camera, complete with a foil flash box…she came home with a scalding sunburn from the reflected sun on her face. oops. 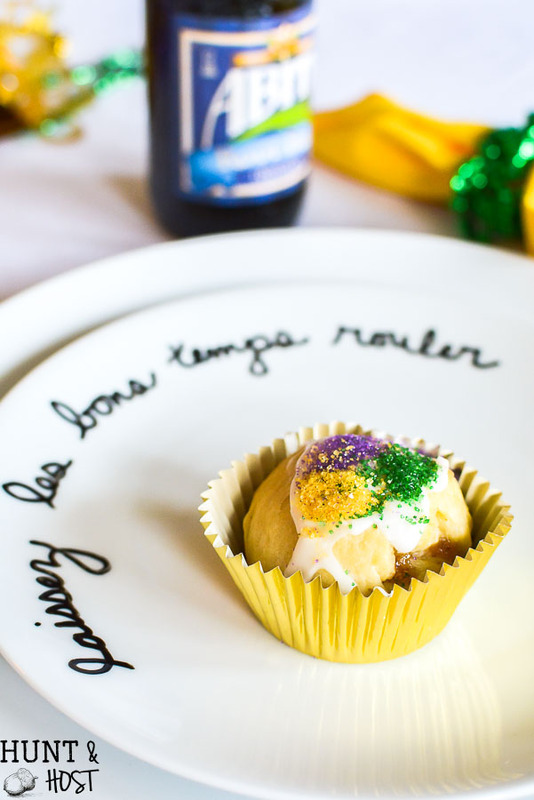 No Mardi Gras party is complete without king cake. You HAVE to have a king cake. No exceptions! The tradition is whoever gets the baby in the king cake has to throw the next Mardi Gras party. These parties would go on for weeks, just rotating houses in the neighborhood when my mom was young. I wish it were still like that! 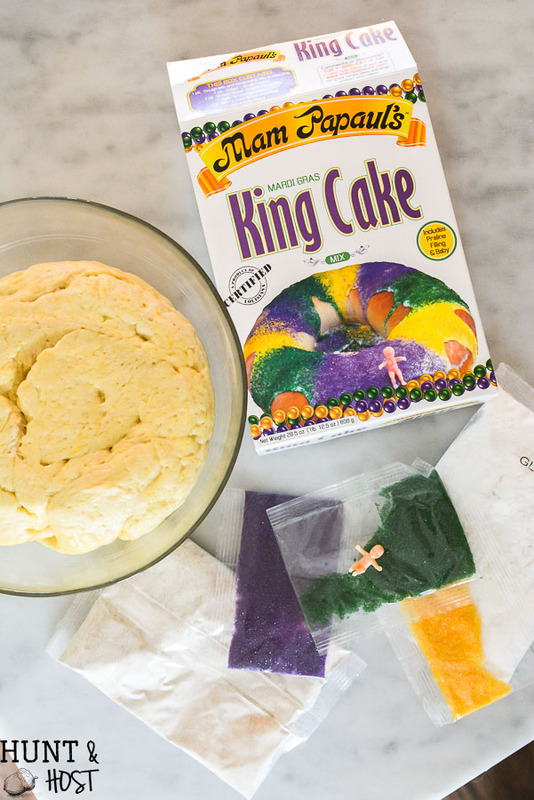 Luckily Cost Plus World Market has a box king cake mix and for a little twist on tradition I made king cake cupcakes, instead of rolling the dough out and making a ring I just balled up the dough into a cupcake (one lucky party goer will get the baby inside!). 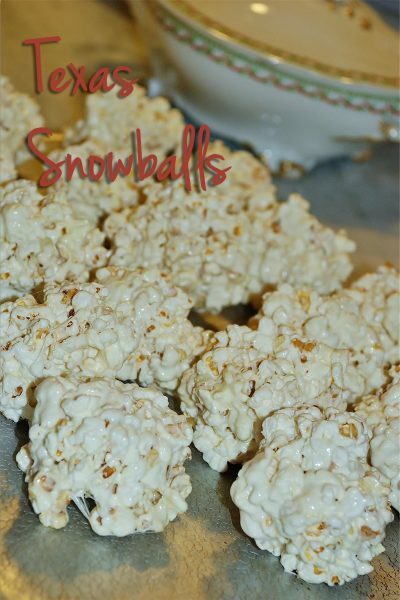 These have a yummy praline filling that came with the box mix. 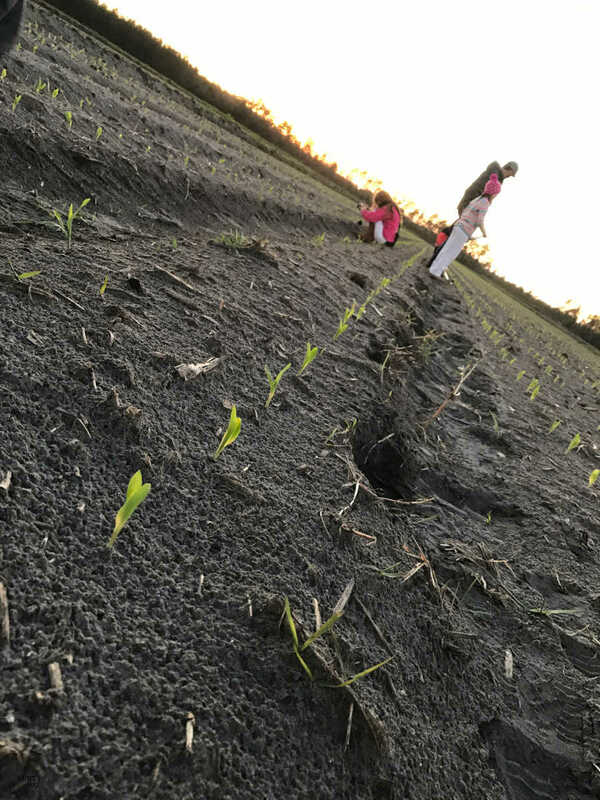 Abita Root Beer is the drink of choice for my little revelers, we love Abita – my aunt actually lives a few minutes from the Abita brewery in Louisiana and we have visited that sweet little town before. Be sure to schedule a swamp tour if you make a visit to the areas around there! 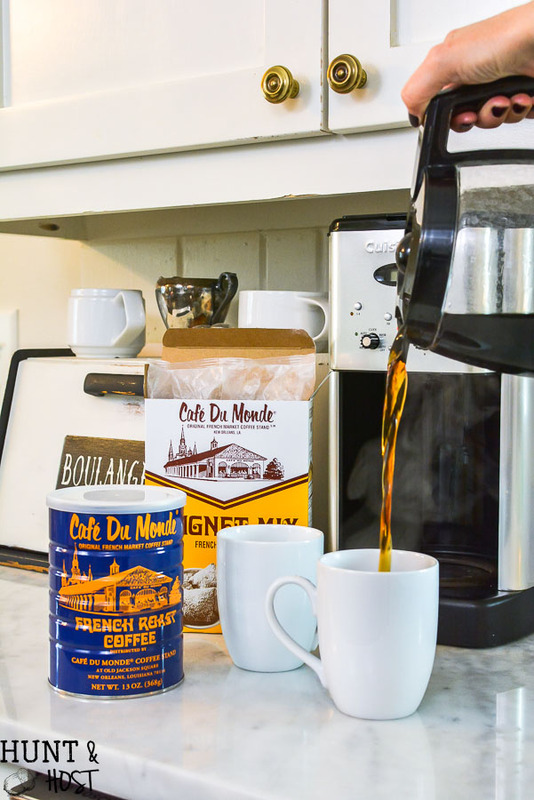 For the grown ups, Café Du Monde coffee and beignets get you feeling like you’re deep in the Nawleens streets. Mardi Gras beads and masks are decoration enough, so I just added a few taper candles in vintage candleholders. These awesome mulit-color drip candles were another World Market find, I love the layered look they give, it’s like a melting surprise. I’ve told you guys before, but my kids are always in love with candles on the table, from lighting them to who gets to blow them out, they’re always a hit. 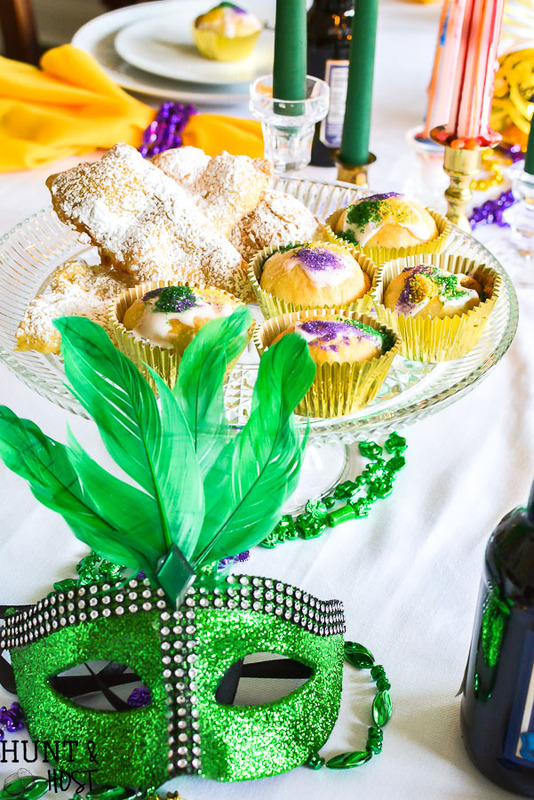 You might want to pin this party for later when you get your Mardi Gras on! Everything looks so fantastic! I’m totally loving the plate writing! I’m so doing this! 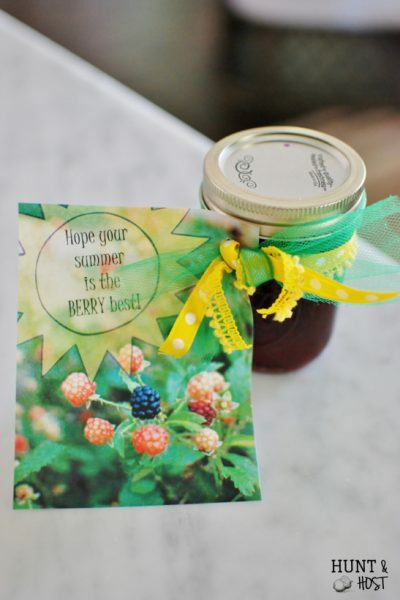 it is so simple and would be fun for a ton of different holiday ideas! I can’t believe it’s almost lent. 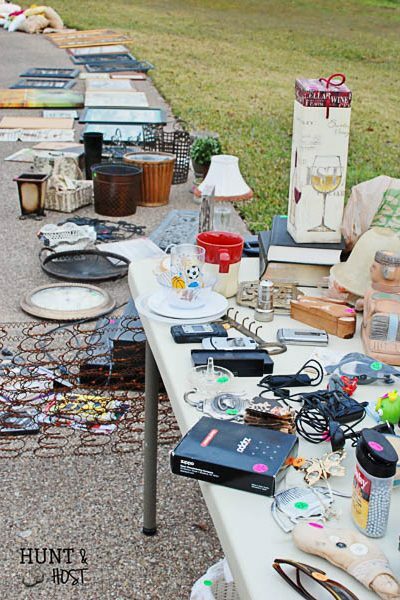 This table is so fun and I love the plate diy too. Great post. I know, time flies! Enjoy the season!